Moira Finucane has been Australia’s unofficial queen of burlesque and cabaret for quite a few years now, taking her own unique style across the country and around the world. 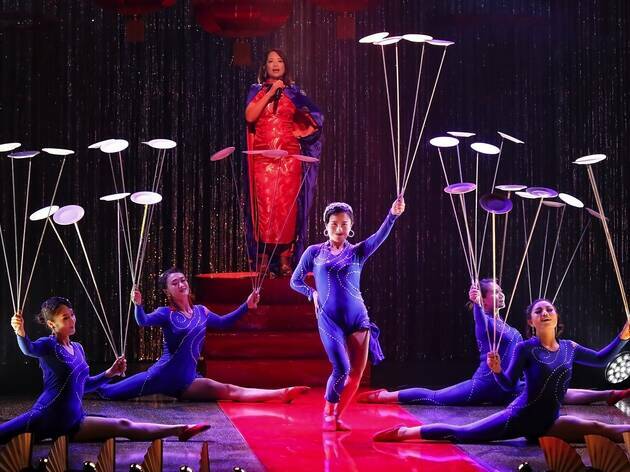 But for her latest show – in which she serves as director but doesn’t perform – she’s spread her wings a little bit further and set her sights on China, with this circus-slash-nightclub, conjuring up the magic of swinging Shanghai in the 1930s. Part of Finucane and her creative producer Douglas Hunter’s inspiration came from a bunch of lost 1930s Chinese records, which were discovered in a trunk in a Mumbai warehouse in 2003. 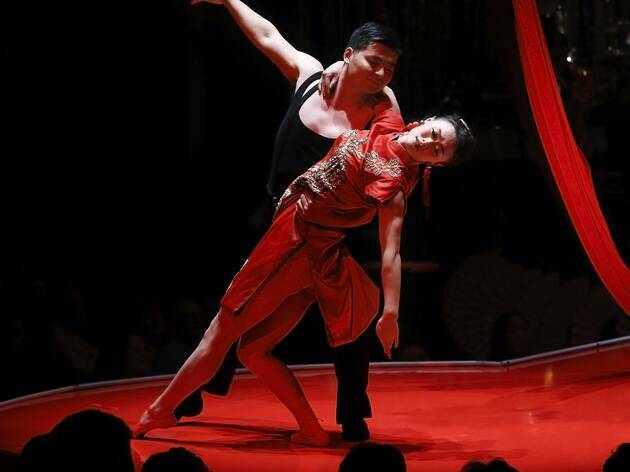 They’re all in a style called shidaiqu, which sits somewhere between jazz and Chinese folk music; a musical metaphor for the buzzing international metropolis that Shanghai was in the ’30s. Those melodious, seductive and brassy shidaiqu sounds are brought to life by a killer onstage band in Shànghǎi MiMi, led by musical director and pianist John McAll. There’s great work from all involved, and stunning solos from Toby Mak on trumpet and Brennan Hamilton-Smith on clarinet and saxophone. The voice of the show – and its occasional ringmaster – is Sophie Koh, a Melbourne-based singer who grew up between New Zealand and Singapore. She tackles the vocal challenges of the show with ease; crossing from sweet and delicate Chinese folk melodies to raunchier jazz fare. She even throws in a playful version of ‘Perhaps, Perhaps, Perhaps’, which sits brilliantly alongside the shidaiqu. There’s also wonderful work from Cameroonian dancer Simon Abbe, who shows off wild jazzy moves, tells a brief story from his life in Cameroon, and performs an achingly brilliant version of ‘Nobody Knows You When You’re Down and Out’. 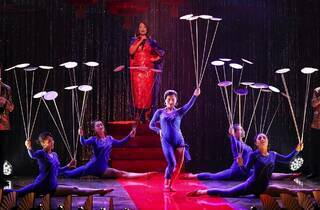 But the main attraction is the Qinghai Acrobatic Troupe, from the sparsely populated Qinghai Province, located high on the Tibetan Plateau in northwestern China. 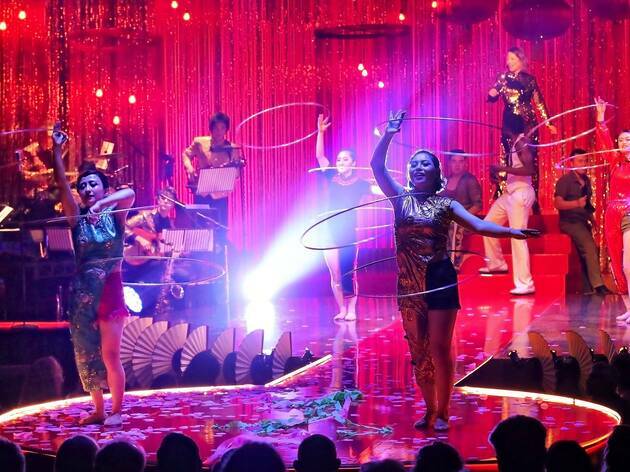 They prove themselves to be extraordinarily multitalented, performing everything from high-flying silk acts to contortion, hula hooping, diabolo and juggling. And given the hugely taxing training regime they’ve been brought up with – apparently only allowed to see their families once every seven years – it’s hardly surprising that they have so many tricks up their sleeves. Eugyeene Teh’s sumptuous design has transformed the Riverside Theatre in Parramatta, and will absolutely take you to Shanghai: red lanterns hang from just about every available fitting, the first few rows of the theatre have been removed to make way for cabaret tables, and a glittering gold curtain serves as the backdrop. His costumes are equally successful, melding European and Chinese designs, with a healthy dose of sequins. On opening night, there were still some elements that were a little shaky. Not the acrobatics themselves – which were as tightly drilled and expertly performed as you could hope – but the acrobats were still a little uneasy with the performance style. They know how to play up to the crowd, but these aren’t the type of acrobats who will easily laugh off tiny mistakes. This is the kind of show that thrives with a more devil-may-care onstage attitude. 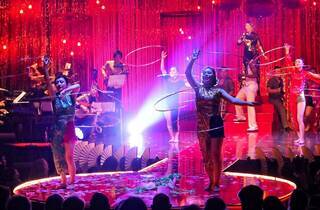 But that’s the type of thing that’ll probably loosen up as the season continues and the troupe gets more experience in performing in this style and gauging the local audience’s response. Once it’s settled, this show will be unstoppable.